School of Aeronautics (Neemrana) provides platform and environment for open discussions and interactions between the faculty and students and is designed to ignite and serve the urge to explore and learn beyond boundaries. This would enable the students to discover, nurture and expand their individual talents, skills and interests so that they emerge as leaders in path breakers wherever they go. Buoyed by the USD 12.5 billion deal with SpiceJet, French major Safran's CEO Philippe Petitcolin has said it expects more such big deals and higher share in the Indian commercial aerospace market. Safran, which has a significant presence in India across commercial aerospace and defence segments, has just inked a USD 12.5 billion (over Rs 81,000 crore) worth deal with no-frills airline SpiceJet for CFM aircraft engines. The Safran-SpiceJet deal, under which around 340 engines are to be supplied to the budget carrier, is also one of the biggest in Indian aviation sector. "Of course, it is a big deal and when you a sign a deal of more than USD 12 billion you are extremely happy... It is extremely important for CFM, Safran and General Electric, which is our partner in this joint venture. 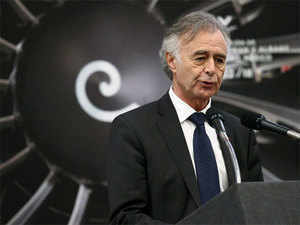 We have to produce 340 engines even if it is over a long period of time, it is something extremely exciting for a company like ours," Safran Group CEO and Director Philippe Petitcolin told PTI. Speaking soon after signing the pact with SpiceJet, he also said that India is a growing country in terms of commercial aerospace market. Indian carriers have substantial orders for new aircraft as they embark on ambitious expansion plans amid growing demand in the domestic aviation space. They are likely to induct more than 900 aircraft in the coming years. To a query on whether Safran expects more deals like that of with SpiceJet, Petitcolin replied in the affirmative. Yes of course. India is a growing country in terms of commercial aerospace market. You have a growth in the range of 17 per cent a year. We need more and more aeroplanes. We are one of the two leaders (in engine manufacturing) in the world. We have a market share of over 70 per cent in the short medium range aircraft segment. We wish to have a better and higher market share in India," he said. SpiceJet and Safran Group have now finalised the purchase of LEAP-1B engines to power a total of 155 Boeing 737 MAX planes along with spare engines to support the fleet. The deal was inked at the Indo- French Economic Partnership signing ceremony on Saturday on the occasion of French President Emmanuel Macron visit to India. CFM engines are manufactured by CFM International, a joint venture between Safran and General Electric. The airline has also signed a ten-year Rate per Flight Hour (RPFH) agreement with CFM Services that covers all LEAP-1B engines powering SpiceJet's 737 MAX planes. RPFH agreements are part of CFM's portfolio of flexible aftermarket support offerings. Under the terms of the agreement, CFM guarantees maintenance costs for all SpiceJet's LEAP-1B engines on a pay by hour basis. According to Safran India's website, more than 1,000 CFM 56 and LEAP engines are in service. The company's joint venture with Hindustan Aeronautics Ltd (HAL) in Bengaluru manufactures CM56 and LEAP components for CFM International. Safran and GE, to provide maintenance training for operators of CFM56 engines.